blindly bought on someone else's (bad) advice. That pump has never been much use as show it a speck of grain and it jams... and jams so well that the only option is to drop what you're doing and dismantle the damn thing. Once people realise they're garbage and they want something better the usual advice is to buy a Chugger. 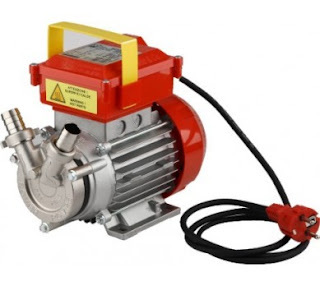 That has always struck me as odd though, as in all my time spent in micro-breweries I've never seen a Chugger pump; their recommendation seems to originate from the US, where they're made, and where of course they don't have European pumps. So using a US-made pump in Europe doesn't seem to make sense when we have plenty of European made pumps up to the job. Enter the Novax 20 B from Italian company Rover Pompe. A semi-professional pump intended for transferring beer and wine. The Novax bit means it has Viton® seals, which can be operated at higher temperatures than their regular transfer pumps. I've done a comparison of the home brew Chugger model and the Novax 20 B below, though the 20 B is equivalent to a higher model. I picked mine up for €102 including shipping from here in September 2015, so this is a long term review. *US-bought 230v Chugger pumps are not CE marked. As can be seen in most ways the Rover Pompe model is superior. Magnetic drive is normally preferable but with food grade seals and bearings along with thermal protection and reversible operation direct drive is probably more beneficial. I use this pump for whirlpooling without issues. 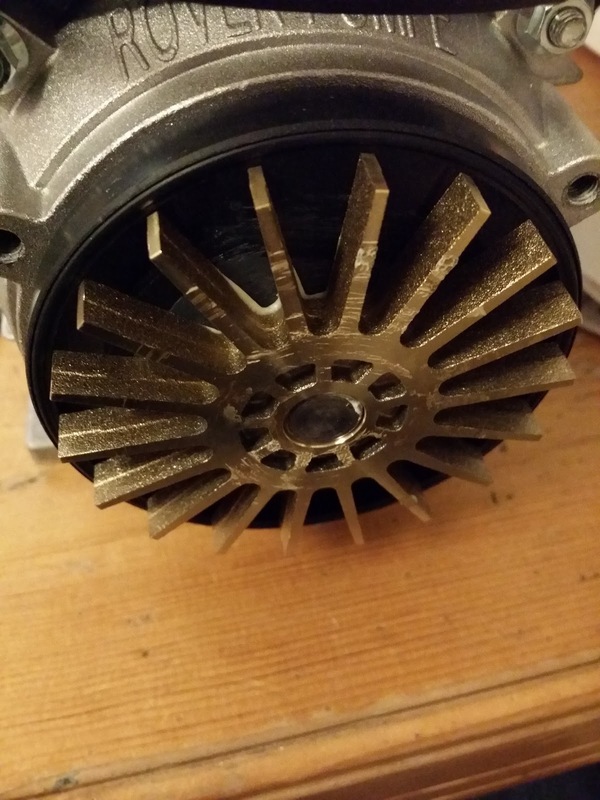 The body of the pump is passively (fins) and actively cooled (yes, it has a cooling fan!) so I haven't checked the pump body to see if I'm exceeding the 95°C but it works flawlessly. Viton® has a working temperature of twice boiling point. Self priming: While it won't self-prime from a height dry it will self-prime dry if it's not far from the surface of the liquid to be pumped. Add a drop of water into the inlet pipe to wet prime and doing so from any height isn't an issue. BSP fittings, so no anxiety about connecting other locally purchased fittings. Being as powerful as it is this pump will collapse silicone hose on the inlet quite easily due to negative pressure (the manual does state that reinforced hoses should be used). It also pumps way too fast for a lot of jobs, like transferring to the fermenter. 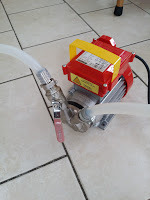 There is a version of the pump with a built in bypass valve that can reduce flow by 50% but my understanding is that it's not reversible, and it costs about €35 more. However fitting a throttle valve to it is a simple job. A €6 ball valve from B&Q along with a 3/4" rubber washer and we have a factory-look throttle valve that works perfectly. Note: if doing this you should only throttle the outlet. Throttling the inlet does no harm to the pump but it doesn't work well. You should never throttle the inlet of a pump which can't be run dry like a Chugger as you risk damage to the pump. Very interesting Shane. Pity it's not rated for caustic. Thanks Peter. I've since spoken to Mark Nixon about caustic as used in a brewing environment and Viton is compatible at those concentrations. I've updated the chart to reflect that. I am currently debating myself between using either the Novax 20B or Chugger 230V. The Novax is a much better machine, but the only downside is its excessive power for a hombrewing operation. According to the manufacturer (I happen to speak Italian and droped them a line to find my answer), it is NOT recommened to install a valve in the outlet. They do recommend the bypass instead. Thank you Shane, very well done. I am currently trying to decide wich one if this pump should I add to my 50L homebrewing setup. The Novax is definately a much better machine, but the problem I have is that the 20B is too powerful for the job. According to the manufacturer (I happen to speak Italian and decided to contact them to hear their recommendation), the installation of a valve in the outlet is NOT a good idea. They do recommend the bypass instead. Thanks for the kind words! Fitting a throttle valve is not unusual for a pump like this, and I think the bypass recommendation might be a sales pitch, as they sell a version with a bypass valve. It is a powerful pump, no doubt about it, but I don't find it excessive. 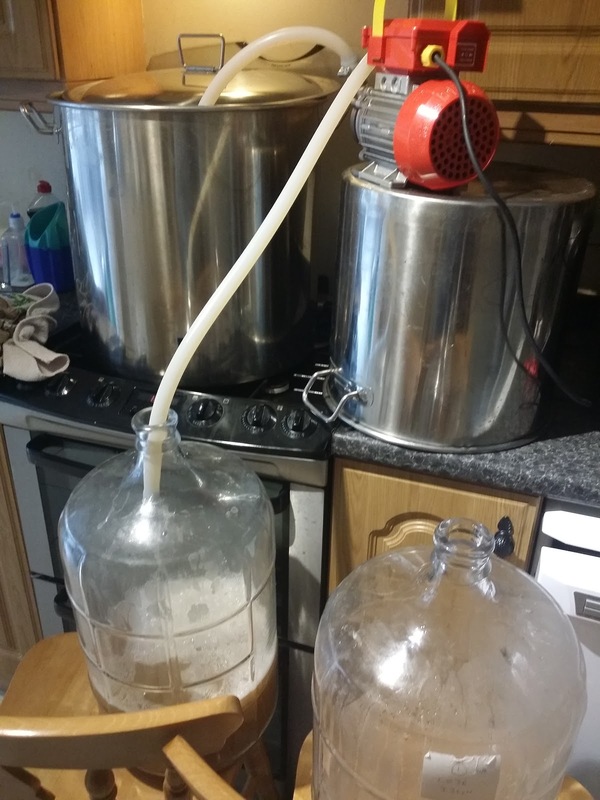 I know another home brewer who has two of these in his setup, complete with throttle valves, and he loves them. They've being working flawlessly for him for a lot longer than I've had mine. Sorry man, it looked like my first comment did not go through and I sent it twice. However, now that I know you and your buddy use it with the ball valve to control de flow I might give it a try. My problem with the bypass is due to cleaning/sanitazing, considering the bypass I've found in the web. My other idea is to add a grant to my system just to avoid stuck sparge. That said, where did you find the Novax 20 B with threaded fittings? and do you know of a store where they sell it with the bypass installed? The barbs screw on, when you unscrew them there are 3/4" threads underneath. So just think of it as 3/4" threads with free barbs! Glad to be of assistance! Drop me a message through the Contact Me on the above right... I'm doing the opposite to you shortly...I'm moving from Europe to the US! Can it runs on 1/2'' pipe fitings? I bought this pump, but i have 1/2 inch valves. Can I change pump hose connectors from 3/4 (20mm) to 1/2 (15mm)? Is it going to muffle the pump and damage it?